On the 6th of April 2015, the government is bringing in a law making it compulsory for all dogs in wales to be micro chipped. Micro Chipping can help reunite owners with lost or stolen pets, relieve the burden on animal charities and local authorities and protect the welfare of dogs by promoting responsible dog ownership. Anyone that does not comply with this law could face a fine of up to £500. I am fully Insured, Trained & Certificated by pet-detect to microchip small animals. 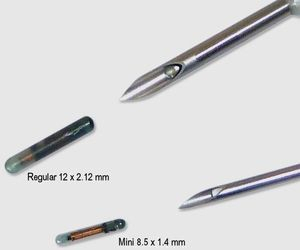 I offer mini microchips these are 40% smaller than the standard chip, at 8.5 x 1.4 mm compared with the bigger old chips which are 12 x 2.12 mm. The smaller size and weight means they are much less likely to migrate away from the injection site, and we also use a much smaller needle, meaning micro chipping is less invasive for your pet. Microchipping can be done at our premises, or alternatlively we can travel to you avoiding any unecessecary stressful trips to the vets. All microchip registrations are completed online by me, so there is no need to fill in or send off any forms. The microchips are registered on the Petlog database which is run by the UK kennel Club, and is the UK's largest lost and found pet service for microchiped pet.The Petlog database is also linked to a European wide network of databases, which includes 32 databases working together giving you the best chance of finding your lost or stolen pets even if you are in another country. The Petlog call centre is open 24/7 365 days a year and is based in the UK - that means it's always easy to contact them. I can microchip your dog, cat or other small animal in the comfort of your own, no more stressful trips to the vets, or alternatively if you prefer it can be done at our premises. By having your pet microchiped you will be ensuring they are permanently identifiable, especially helpful for litters before they leave your premises. Please book appointments at least 24 hours in advance. We will try to accommodate appointments booked at short notice however advanced bookings will always take priority. If you would like an appointment you can contact us using the form below.